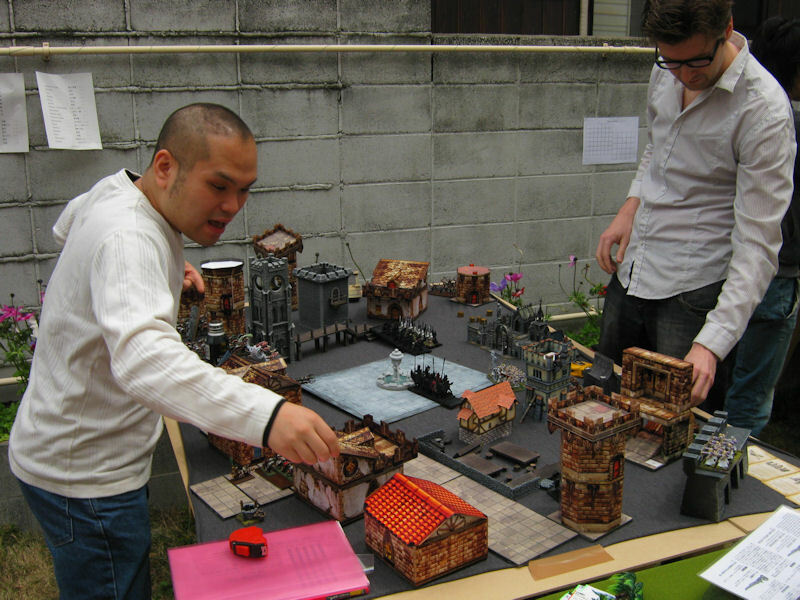 For our second annual Warhammer tournament, renamed the "Kyushu Tournament" this year, we managed to gather 10 keen hobbyists ready to fight 3 battles in a single day, across a variety of challenging game boards. 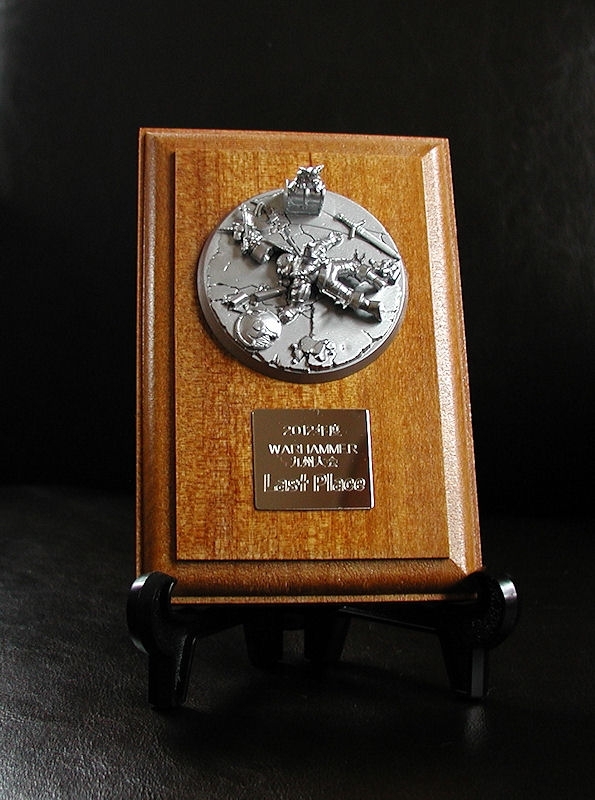 The winner would receive a custom-made trophy, and this year also featured a comedy-version 'Last Place' trophy. 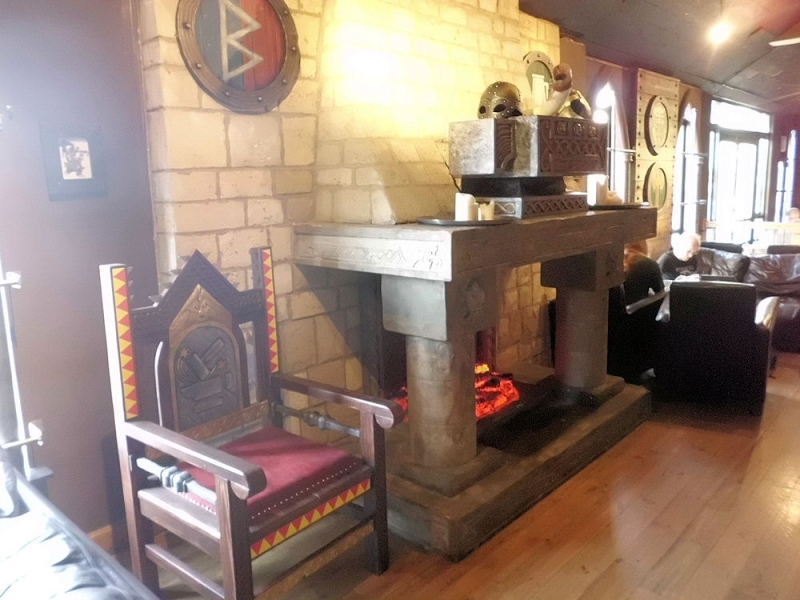 The Beppu players had arrived the previous night, and followed by a quick watch of "Knight's Tale" (Heath Ledger jousting) to set the mood, the talk turned to the coming tournament. 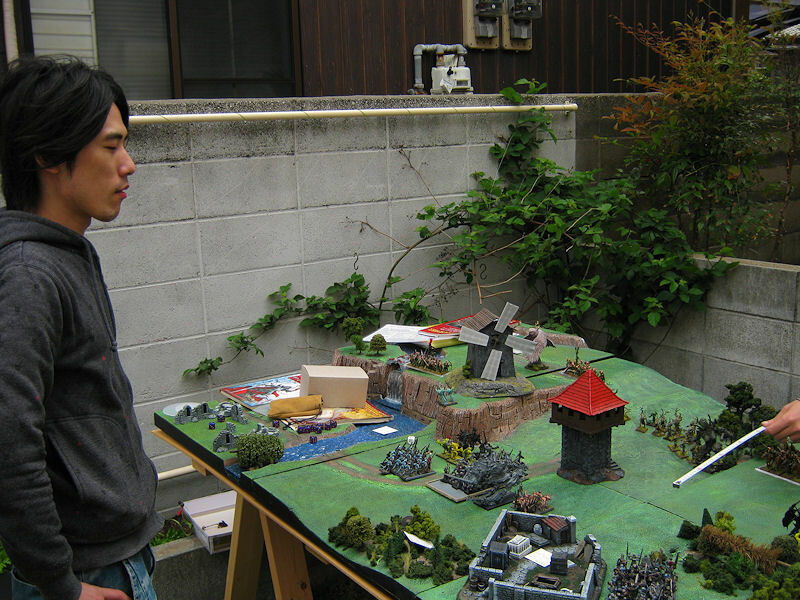 Nagai-san, who claims not to sleep much anyway, sat himself down and started painting his massive units of Bretonnian knights. Next morning, he was still painting! Does the guy even sleep?! 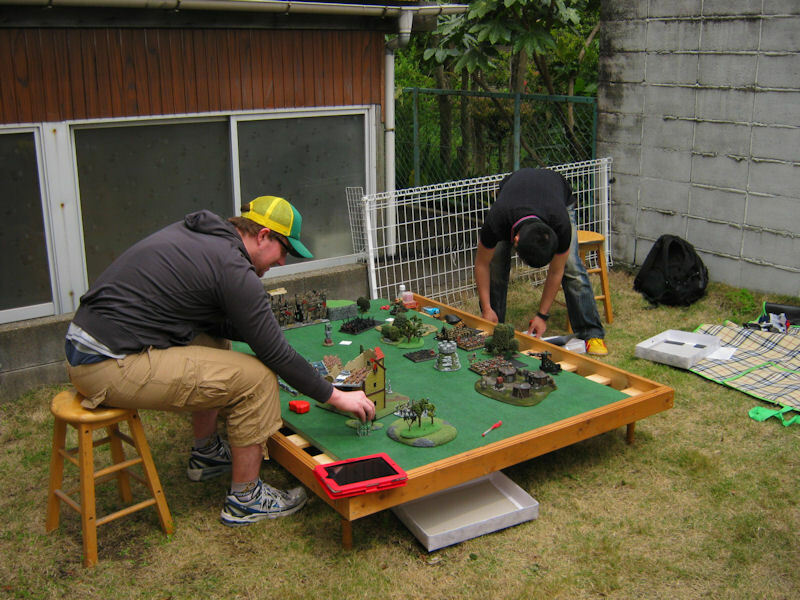 The sun was shining, so we took a bit of a gamble and set up the seven gaming tables outside in the garden. The weather stayed fine for the whole day, except for the annoying gusts of wind which occasionally made the roofs of the Bogenhafen town board fly off the table. Thank goodness for blu-tak, eh? 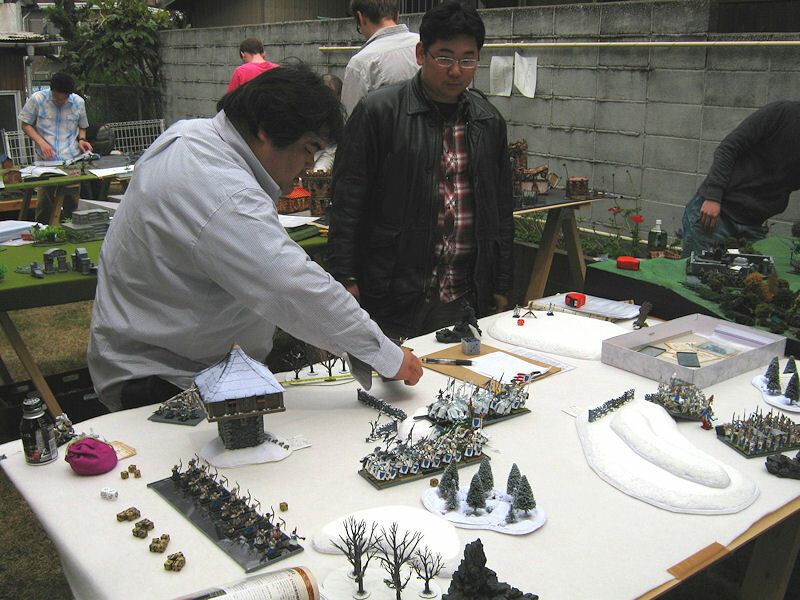 This was Hoshioka's first ever game of Warhammer! 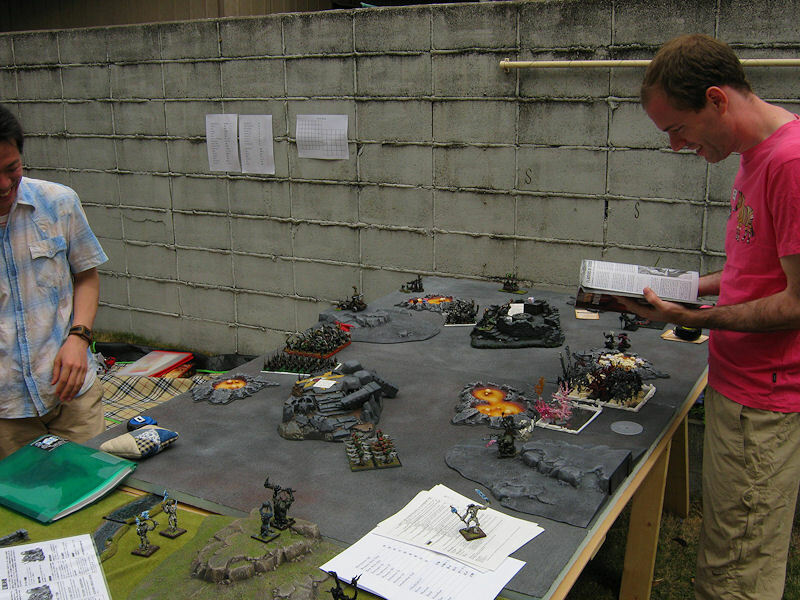 All going smoothly, until his army tray tipped over before the game - he had a massive 190 models to setup! Random trolls amble on to this desolate board throughout the game, and Steve was unlucky enough to get charged in the back by one of the first turn (it even passed its Stupidity test on a 4!). 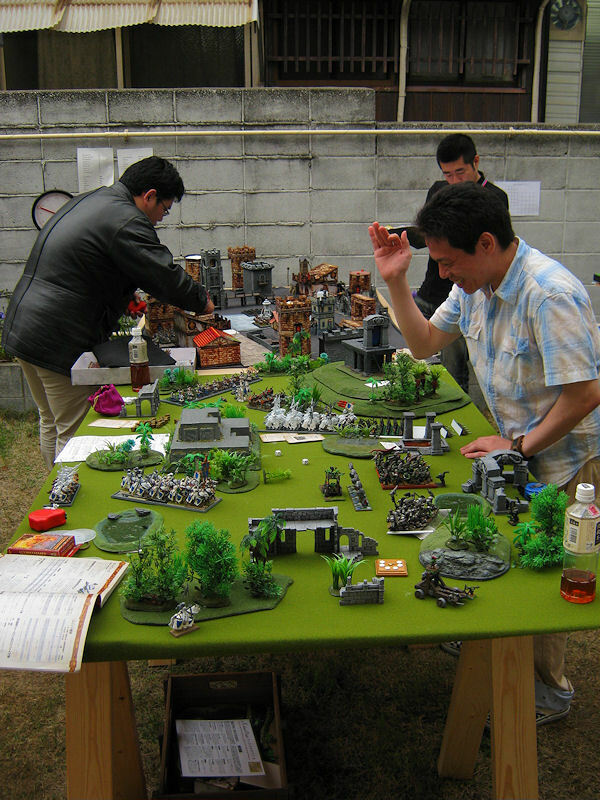 Vlad had said before the tournament started that the one table he really didn't want was the town table. So, naturally, that's what we rolled for his first game! 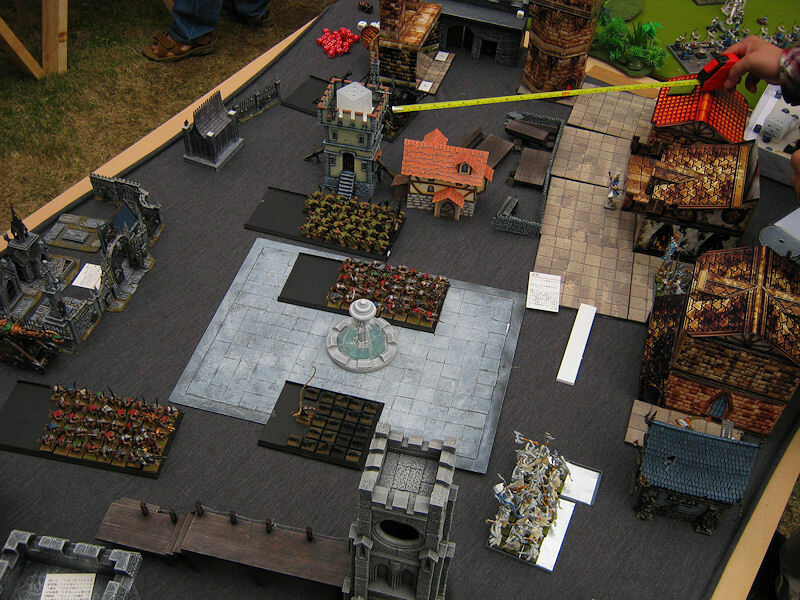 Not only do the multitude of buildings make lines of sight hard, but because of the Dawn Attack scenario rules, your units might start the game in completely the wrong place. You really have to think on your feet for this one! This scenario plays lengthways down the table, and Nagai-san's knights had a tough time charging through the snow, it seems. In the final turn of this game, I was amused to find the watchtower objective completely empty, but surrounded by 4 opposing units. Abe-san's dryads were closer by half an inch, so he got the victory! Didn't take many photos of Round 2 games, but I thought this was a funny shot. 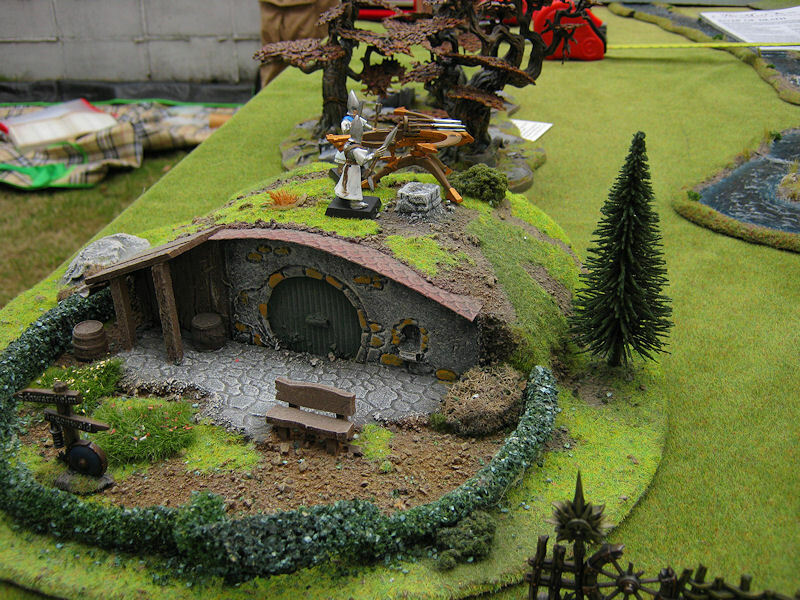 Poor old hobbits - all they want is to be left in peace, and some daft elves setup for battle on their roof! 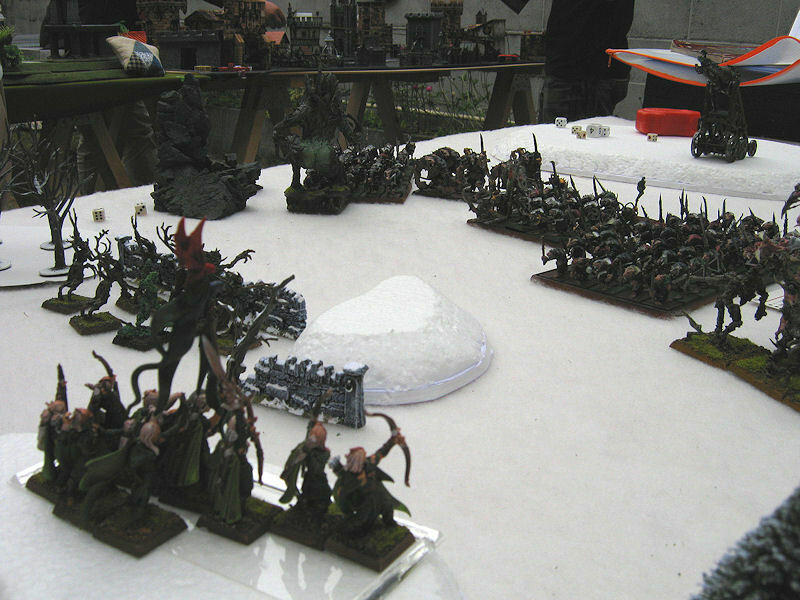 Things didn't look good for Abe-san's Wood Elves as they were swamped by endless hordes of rats. His giant treeman managed to stem the tide somewhat, but Baba-san's Hellpit Abomination rampaged through the other flank. 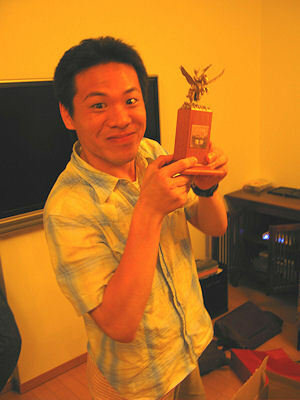 Adding up the victory points, Abe-san was surprised to find he'd won ... by only 130 points! How the heck would you stop these guys?! Another extremely close game, with Yas pulling off a win by only 160 victory points. If you're wondering why he's laughing, it's probably his snotling pump wagon. Those plucky little guys managed to get a charge on the Bretonnian knights, even killing one, and holding them up for a turn or so! Poor little hobbits were having a bad day. 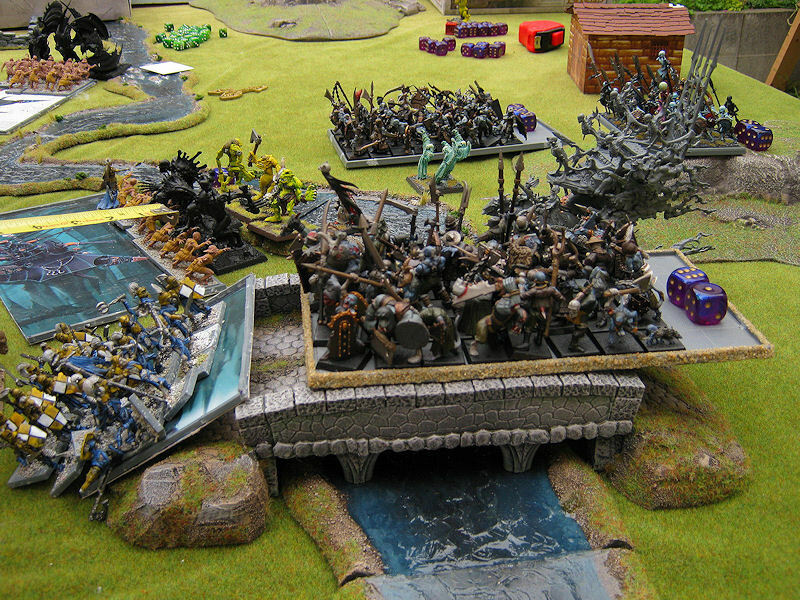 This time, two undead forces invaded their farmland and decided to annihilate one another for the river's two crossing points. This game was the only clear victory in the final round, with Miyao-san's vampires wiping out Nathan's vampire force in only a few turns. Ouch! So after 15 frantic games (about half of which came down to only a few hundred victory point differences), we had a clear winner. 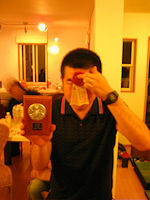 Yas-san managed to win all three of his games, and even got a bonus point for super sportsmanship! 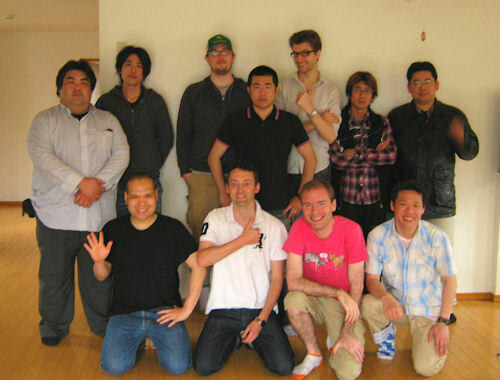 Special mention must go to Hoshioka-san, who was not only brave enough to take part in a tournament for his first ever warhammer game (and against English-speakers! 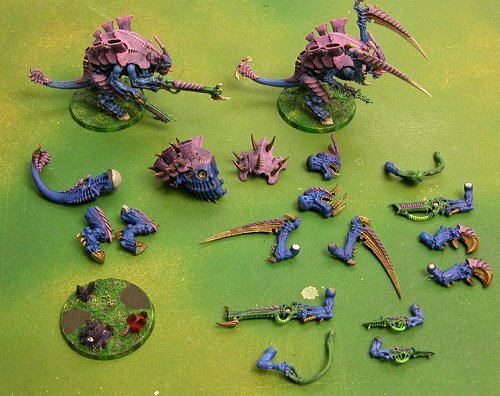 ), but also had to put up with his warp-lightning cannons misfiring 8 times!! 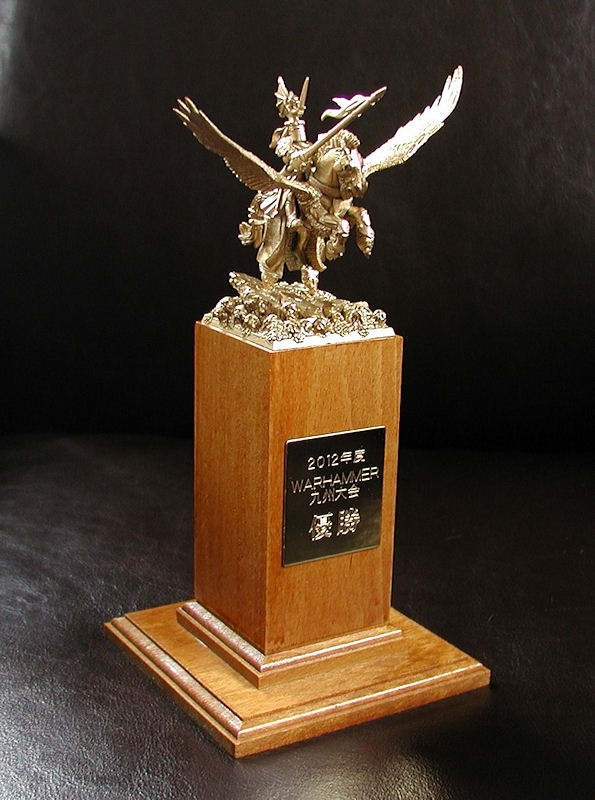 If anyone deserves a trophy of his general having been stabbed in the back multiple times, it's Hoshioka-san!